Julia Fonseca This is what Rosemont could be! Is it Phelps Dodge Sierrita or Cyprus Minerals? Content of Leach Solution of "Incidents"
Keep toxic metals out of the environment! Times have changed in Arizona. Copper used to be on the top of the list for economy, providing jobs for a few, while sending the big profits to “backers" in New York City. Now Arizona is considered the perfect place for retirement and winter vacations, providing a boost to the economy in many sectors. This means we need clean air and waterSo isn't time to add "clean" to Arizona's five "c's"? The sad fact is Arizona was ranked the third most polluted state in 2002, principally due to hard rock mining. Specifically in Green Valley, we face the dilemma: Are we going to allow the local mines to continue polluting our environment, especially our water source; thereby jeopardizing our health as well as our future water supply?There's only one way to stop the pollution and that is to take action. Now is the perfect time because Duval/Sierrita mine is scheduled for its "Aquifer Protection Permit." [What is an Aquifer Protection Permit?] This means that we will have to file for a public hearing if the Permit Draft does not meet our standards, particularly in regards to the existing toxic plume that has been created in the aquifer. The figures for the toxic waste being dumped at the mine site, which sits partially on public land, are staggering. Following you will find information and links to environmental sites that will help you in understanding the problem, so that you can decide if you want to join in the efforts to save the Santa Cruz Aquifer. Also see links on "Information on situation in Green Valley" in the left column.Hard rock mining is Arizona's top source of pollution. Metal mining accounted for 89% of pollution reported by all industries in Arizona in 2001 even though mining comprises only 4% of industrial facilities operating in the state (Toxics Release Inventory, EPA 2002). It is clear where the problem lies that gives Arizona its status as the third most polluted state in the Union! of pollution. Department of Water Resources keeps allocating water without a plan. 1) Release of toxics materials into the air.2) Economic costs to the community.3) Clean-up/reclamation of the site. 4) Spoiling of landscape and aesthetic beauty of our Green Valley. 1) We want the quality of water for the Aquifer Protection Permit to be set at the ambient level that existed in 1985. This is the level that existed when Cyprus/Phelps Dodge first started the Aquifer Protection Permit process in 1985, and again in 1995--but they never qualified because they needed more and better equipment. What was the incentive? If they did not have the Permit, they could just keep on polluting--and increasing the toxic levels in the aquifer. (See Community Water Co. Data.) The mining company should not be rewarded with lower standards of water quality just because they avoided the permitting process for ten plus years! 2) We want some resolution for the damage already done, specifically, assistance in having Phelps Dodge keep their promise to remedy the present mineralization problem in the aquifer at Community Water Company's Wells 7 and 8, which they have been aware of, and publicly acknowledged in October 2003. [See Green Valley News Article]3) In regard to water quality: Enact legislation to adopt as law the Environmental Protection Agency's secondary regulations for drinking and ground water. "EPA recommends secondary standards to water systems but does not require systems to comply. However, states may choose to adopt them as enforceable standards." By adopting these reasonable standards, the levels will not reach emergency levels before an attempt is made to do something. See EPA secondary standards. In Arizona water is a precious commodity. Why do we allow mines to continue to pollute it—while we have to buy reverse osmosis filter systems that take 3 to 4 gallons of water to produce 1 gallon. 4) In regard to water resources: Require the mining operations to switch to CAP water instead of taking water from the Santa Cruz Aquifer.5) Have an objective party survey the Aquifer to determine exactly where the tailing pond plumes areand also survey exactly where the highest levels of arsenic are found in the aquifer. (Another issue apparently not related to mining in our area, but appears to be Mother Nature's contribution. )6) Have mines put water treatment plants in sites where monitoring wells show high levels of TDS and Sulfate. We have reams of data from monitoring wells but no one does anything. Let them pay for filtering the water instead of all of the residents of Green Valley. 7) When there is a violation and a fine is paid, that money should go back to the envioronment: to ADEQ to pay for their work and also to the community that has been violated, so that they have funds to pay for the damages. The ADEQ is under financed. For example, in Nov. 2001, they lost money for clerical help to put the "Hazardous Material Incidents" reports on the web. This is important information that the public and other government departments needs to have access to. 8) Create a committee that oversees all of the operations of the mining, so that each department provides summary information to one place. Now, everything is divided up into different categories, for example, toxic waste has three departments, and no one knows what's going on in the other departments. Reports are buried in reams of paper, making it a major chore to find any relevant information.9) Ask for an investigation as to why the relevant information for Phelps Dodge Duval/Sierrita Mine was left out of the recent report (Upper Santa Cruz Basin Groundwater and Land Use Update, 2002) by Pima Association of Governments. Also the high TDS numbers for Community Water wells were omitted from the water quality tables. 1) Inform yourself of the situation by reading this website and its links to important environmental information and groups. 2) Tell your friends about the websitecomputers and people to show you how to use them are available at our local Green Valley library. 3) Keep in touch with the "Save the Santa Cruz Aquifer" efforts by checking this website or e-mailing action@savethesantacruzaquifer.info to be notified of any meetings and public hearings. There will be some informational meetings at the library with videos concerning hard rock mining and water usage in Santa Cruz Basin. 4) Express your concerns by contacting the ADEQ and your elected officials (Contact info to act now! )We have an opportunity to put democracy"government by the people"into action! We wonder why there is such an increase of cancer and disease nowadays, but if we take time to read the inventories of Toxic Waste released into our environment every year, then the question no longer will exist. Toxic Chemicals in the air and water can damage our organsparticularly liver, kidney and respiratoryand compromise our immune system by overtaxing it, so that we do not have our natural resistance to disease. An Environmental Protection Agency states that hard rock mining is the country's top source of pollution. How can gold and copper and silver pollute the air? It's not the precious metals, as the mining process retrieves as much of them as possible. The problem is caused by the other non-useable metals and chemicals, such as lead, manganese, cadmium, which were in the rocks along with the precious metals, that are dumped at the mining site to leach into the soilor take a ride on the wind. In addition, non-potable chemicals are used to leach the metals from the milled dust, so more chemicals are produced in the leaching process to remove the metals. See Information Resources to obtain a free CD-ROM from EPA on hard rock mining. 1) Seepage of toxic materialssulfates and heavy metalsfrom tailing ponds. Gold and silver and copper are no longer lying around on the ground and in rivers waiting to be picked up or panned. The days of following a rich vein to extract ore with high percentages of desirable metals have faded. Mining is now dependent on heavy mechanical technologiesit's a dirty business. Mammoth diggers and trucks dig up holes in the ground up to 3 miles wide and almost as deep. The rock that is considered useable—sulfide rock in this area, which is .2% cooper is taken to the mill to be crushed to dust, then the dust is put into a solution with toxic chemicals to separate out desired copper and molybdenum, using large amounts of water. The slurry with its toxic chemicals (VOC's) and heavy inorganic metals that are primary contaminants are then put in unlined tailings impoundments and left to seep into the groundwater. See Data from Community Water Co. Wells. 2) Spills of "hazardous materials" on site. There are intermittent spills of toxic materials on site. See Sulfuric Acid Spills. These "incidents" are a major concern. They usually result from the breaking of a pipeline or a pressure gauge malfunction, so actual volume is difficult to measure. When the TDS and sulfate data is correlated with the spills of sulfuric leaching solution at Duval/Sierrita site, it appears that the spills do cause an immediate and toxic response in all of the Community Water wells. See Community Water Well Testing Data. The risk of large toxic spills is a continual danger in our area. See Leach Solution Ponds data. The time from the spills to the impact at CWC Well No. 8 has been determined, thus confirming that the sulfuric acid from spills and any other toxic chemical is entering the groundwater and impacting the public water wells. See Spikes at CWC Well #8. 3) Dumping of toxic waste, principally sulfides and toxic metals, on site. The "Total On-Site Toxic Releases" reports that toxic waste dumped into leaching ponds and on site (ground or dams) are released into the air. Over 328 million pounds of toxic waste was released in the state of Arizona in just one year (2002)! Seven of the top 10 polluters were mines. 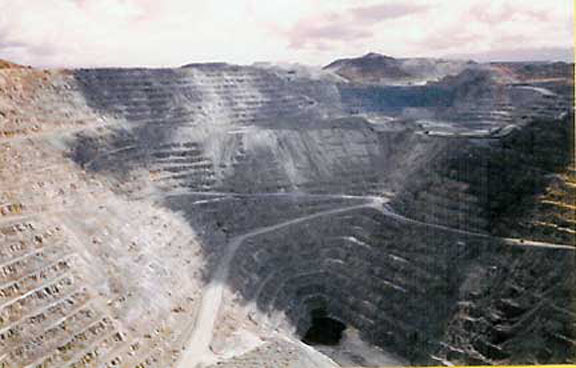 In 1998 the Cyprus Miami Copper Mine in Arizona released twice as much toxic waste (123 million pounds) as all of the waste released in New York State (60 million pounds). In 2001 Arizona's mining industry released 36 types of toxic chemicals to land, air, and water, led by copper compounds at 416 million pounds. Lead ranked fifth in prevalence in mining waste at 9 million pounds while arsenic ranked sixth at 2 million pounds. Other toxins released by the mining industry included mercury and cadmium. The numbers get worse each yearespecially now that the price of copper has gone up due to the demand for it in China. 4) Water UsageHas anyone noticed that we are living on a desert? By a wonderful gift of nature, the major source of water in dry, arid Arizona is natural underground water. Phelps Dodge uses 23,682 acre feet annually (ten year average), whereas Asarco uses 11,485 acre feet annually (ten year average). Compare the numbers: residents in Green Valley, Sahuarita and environs combined use 3,600 acre feet of water annually. Already, there has had to be installed a recharge plant at Pima Mine Road. (Who paid for it? A combination of CAP and Tucson city water usersto ensure water for their future. )The largest part of the water usage is due to an effort to keep the chemicals that are leaching from the tailing ponds from running down the hill to the aquifer. "Interceptor wells" are dug to catch the seepage and water is pumped through these wells to create a force that draws the seepage into the pumped water. In an effort to conserve water, the mines do reuse this water until it is toxic sludge, then it goes into the tailings pond to seep back into the ground water. Is some logic missing here? So the bottom line is the mining operations use tons of water, which they turn in to toxic sludge.... which seeps back into our groundwater and aquifer. Subsidence: Aside from the problem of water usage in the desert, there is also the issue of a phenomenon called "subsidence." Subsidence occurs when the ground water gets too low, causing the muds, clays and gravels that make up the aquifer to dry and compact. Even the land level can start sinking causing large cracks in earthand homes. The actual underground flow of water extends several miles in each direction from the actual Santa Cruz river bed. So the Santa Cruz Aquifer ranges from 4 to 15 miles across. Guess what! Green Valley is directly over the Santa Cruz Aquifer, and so is downtown Tucson! Subsidence is a major problem in many areas of the West. See U.S. Geological Report on subsidence from ground-water pumping. 1) Release of toxic materials into the air. . . Through smelting of molybdenum, blowing of materials from toxic waste dumps, and evaporation of leaching materials from tailing pond. For any brave souls who have time there is extensive information on the air quality issue. See Technical Review and Evaluation of Application for Air Quality Permit. The bottom line is that Phelps Dodge obtained their "air quality" permit in 2002 (good for four years) for Duval/Sierrita, even though it is the second highest polluter of air in Pima County. Asarco Mission Mine leads the list. A rep at ADEQ patiently explained to me that the permit means that the pollution the mines create has certain limits! See www.scorecard.org and enter your zip code. 2) Economic costs to the community. The household costs are continual to many residents of Green Valley due to trying to manage the effects of having hard water twice the definition of water hardness. Hard water is defined as 12 to 15 grains/gallon, whereas some readings are as high as 33 grains/gallon. This means we have had to purchase water purifiers, harsh products to clean the lime rings, and replace our appliances that use water more often than predicted life.The Community Water Co. has to replace one of the wells (and needs to replace two) that was unfortunately engulfed by the tailings sulfate plume. The cost to the member-owned company could be up to one million dollars. At the present level of sulfate, it is impossible to install the arsenic treatment mandated for 2006. The Community Water Co. is paying hundreds of thousands (over a million) for CAP water allocations because they are afraid the water supply will not last due to the heavy useage by Phelps Dodge. It has to be considered if Pima Rd. 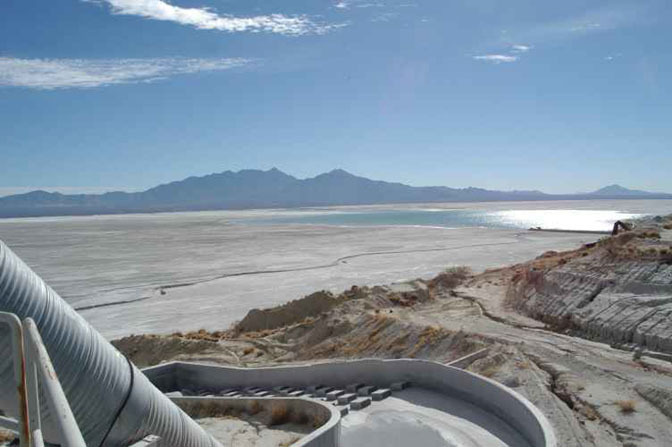 recharge plant was constructed because of the heavy usage of water by Pima/Mission and Duval/Sierrita mines. Anyone want to do the math on this one? Many people call clean-up "restoration." This is a gross misconception. The pits are left to become toxic water lakes. The tailings ponds are left to evaporate (assuming it doesn't rain). We have two good examples: Ajo and Bisbee. Both are closed, yet they look the same as they did when in full operation. (By the way the Ajo tailings pond dam was once the largest dam in the worldholding millions of gallons of toxic sludge.) Clean-up when and if the copper runs out, it may not happen soon, so those dams will get higher and higher. (How tall will they grow?) But when the mine does close and have to clean up its mess... what happens? The dams will stay there, the ocean of toxic waste with its dam walls will remain in place. At best, a layer of stones will be placed over the white powdery waste (when the water finally evaporates) to prevent the flying of toxic dust on windy days. See more on "reclamation." Check out what happened recently at a closed copper mine in Nevada. Another problem is called "dewatering." When the mines have been pumping water out of the pit, the pit will naturally fill-up when the pit and "dewatering" is abandoned. Nevada has been the victim of this phenomenon. The result: a toxic lake. See more information from Great Basin Mine Watch non-profit organization. We all love Green Valley. It has a lot to offer and even though some of us have lived in New England, we still appreciate the quiet beauty of the stark desert. There's not a single type of terrain here that does not support some type of creature, critter, or creepy crawler. They have all adapted in ways that are miraculous. The diversity of plants is also worth preserving. In addition to preventing erosion, they provide shelter and food for the desert birds and animals. We have all forgotten that there used to be view of the Sierritas Mountains to the westnote the hidden peaks on the photos. How the System let us down. . . .
How can such high numbers of toxic materials exist in the water? The numbers have gotten out of control because of the policies of the governing agencies. Don't we have the Arizona Department of Environmental Quality Protecting us? The sad truth is when the ADEQ was formed in 1987 they opted to put the existing mines at the bottom of their priority list, allowing them to continue degrading groundwater and rivers unabated for some 17 years. An Aquifer Protection Plan had actually been started in 1985 after the Mines Task Force showed the dangers in this area of pollution by the tailings ponds. See a historical record of how the mines managed to avoid the stringent standards of an Aquifer Protection Permit. What do you think? Is it just the mines who are accountable?This waiver can even be carried through several transfers of ownership, as in the case of the Duval/Sierrita mine. This neglect is hard to comprehend, considering the extremely high levels of TDS, sulfate and hardness in the monitor wells of both Duval/Sierrita and Pima/Mission mines revealed by the comprehensive study done in the early 1980's by the Mines Task Force, funded by the EPA (Environmental Protection Agency) and USGS (US Geological Survey). The results were published by PAG (Pima County Association of Governments) in the report: "Ground-Water Monitoring in the Tucson Copper Mining District." [Available from Pima Association of Governors: $20] At that time, there were records and measurements of the level of Aquifer pollution by four local mines (two have been combined with the larger Duval/Sierrita and Pima/Mission mines.) The task force made recommendations and asked for compliance. However, PAG had no enforcement authority. A few years later, the EPA and ADEQ took over, and the monitoring of the mines was relinquished to them because they do have enforcement authority. So you can see why it was a disappointment after nineteen years that nothing has been done by the "authority" to correct the problem, and, of course, the pollution has worsened.This point is important to understand, for the current Aquifer Protection Permit (APP) will require "prevention of further degradation of an aquifer at a point of compliance"this includes TDS and Sulfate. We will be asking for a return to the levels of the aquifer in 1985 when the APP process began, rather than using the present levels of after nineteen years of degradation. The mines can install a water treatment plant and clean up their mess. Legislators sided with the mining corporations instead of the Department of Water Resources in safety of the mine tailing ponds. See details. According to water authorities, there may be other incidences of legislative favoritism toward mines. For example, water usage planning. However, they took the reward in March, 2005 when they decided to end the Arizona Department of Environmental Quality--because Phelps Dodge was complaining, although the legislators said they did not have to disclose which "business" was complaining. For details, see Phelps Dodge History. 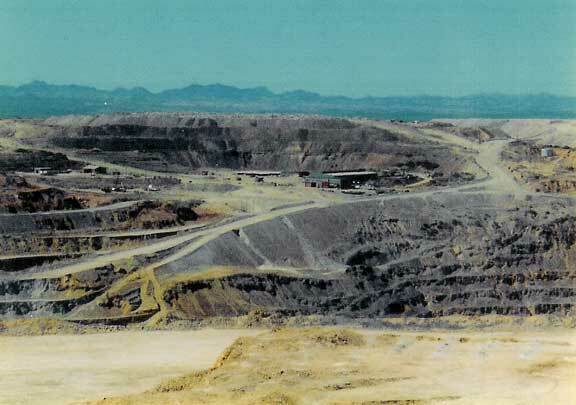 In 1983 Pima County Association of Governments (PAG) in cooperation with Mines Task Force published a comprehensive report on the impact of the mining operations south of Tucson. This report is still used as a reference for mining pollution in the Southwest. At that time, they made certain recommendations that needed to be accomplished to protect the groundwater in the area from pollution from mining waste. Almost twenty years later, in 2002, PAG published a follow-up report to this fine study. However, the follow-up did not mention any work that had been done in monitoring or exacting any compliance with the recommendations in 1983 report. Further, although it did give Tables of water quality in the area, it omitted any Phelps Dodge data. They had requested data from Phelps Dodge, but a PD official responded that they sent in all the data regularly to ADEQ, so it was available there. However, PAG reps were not able to dig through the files and ADEQ and for some reason ADEQ did not provide the data. Additionally, someone who worked on the report told me: “I was told that they did not want to include any negative information.” One would wonder why PAG would want to skew the data of a report that was supposed to be a follow-up to a very comprehensive, straight-forward. If so, why would they go to the time and expense of making any report at all? Surface water rights in Arizona are first come, first serve rights, but the water right holder is granted only the public waters for a statutorily defined beneficial use, at a designated location. Groundwater in Arizona is governed by the doctrine of reasonable use. Arizona has initiated two water rights adjudications in order to quantify and prioritize all of the surface water rights and water right claims to two of the state's river systems and sources. Groundwater is not subject to the adjudication. Interesting, since until CAP came into existence, the majority of water in Arizona, certainly in Tucson, was from groundwater. One would think there would be some clear regulations. Because of an 1872 mining law, individuals or corporations can stake a claim to mine minerals on public land, sometimes termed federal land, at little or no cost to the staker. This land is now managed by BLM. It's a serious situation in Arizona. Look at the statistics. About 400 acres of Duval/Sierrita Mine and one-fourth of the operation of the Pima/Mission Mine fall under the Bureau of Land Management. With the exception of a small piece of state trust land, the remainder of Duval/Sierrita is on private land, however; much of the remainder of Pima/Mission is on "Arizona state trust land." "To manage State Trust lands and resources to enhance value and optimize economic return for the Trust beneficiaries, consistent with sound stewardship, conservation, and business management principles supporting socioeconomic goals for citizens here today and generations to come. To manage and provide support for resource conservation programs for the well-being of the public and the State's natural environment." Since there is no coordinating entity, there is no resort to a clear picture of the whole scene. According to ADEQ/EPA policy, the mines have to get separate permits for air and water. Neither department knows anything about the other and does not want to know: "It's just too much." Then there is the "hazardous material incidents" department, and the wastewater department. None of them know what is going on in the other department. Doesn't it make sense that the people in the Hazardous Material Incidents department notify the Aquifer Protection people of a spill of sulfuric acid? What about the water companies down hill? Then there is the Water Resource Department, which grants the usage of water. This is another issuethe mines require a lot of water to process the ore, which is then contaminated, put into tailing ponds until it evaporates into the air or seeps back into the ground water. In the early 1980's PAG was doing a marvelous job of reporting the problem, although they had no enforcement authority. They backed out of the ground water issue to such an extent that in their 2002 water quality report they purposely did not include any "negative data." That 's now ADEQ's job. If so, why did PAG bother to print a report on water quality when it eliminated the greatest offender?Certainly, there is no agency that is going to take into consideration the economic cost to the residents of Green Valley who have to purchase water softeners, water purifiers, and replace their appliances that use water more often. Do Green Valley water companies have to replace wells more often? Community Water Company has to replace a well now due to the high sulfate level. Water treatment has to be more intensive because of the harsh products that are necessary to clean our clothes, dishes and hard water deposits, such as detergents with phosphates, Lime-away, etc. In an environment that encourages water conservation, we have to install reverse osmosis filters that use 4 gallons of water to make 1 gallon. There must be effects on our general health from breathing toxic air and drinking contaminated water. However, again, the level of each individual contaminant is measured by EPA reports without ever looking at the effects of the whole of the contaminants. The definition of hard water; 12 to 15 grs/gal is considered hard, where Wells #7 and #8 have over 30 grs/gal. Both the Sulfate level and TDS (total dissolved solids) are twice the recommended value. No one ever considers the effect of the sum total of these contaminants that have been added to our water. In addition, we have to factor breathing some heavy duty pollutants in the air. Who is willing to do the math? Yes, we residents, whether full or part-time, are at fault too because of our "there's nothing we can do" attitude. We have seen those dams rising, we have seen the white dust on our furniture and cars, we have seen the water getting harder and harder in our homesyet we ignored the reality. If we want to preserve our carefree life style, we have to get off the golf courses, off the dance floor, and out of the swimming pool and do something. If we don't do it now, we are going to lose our paradise because of pollution and water shortage. There's no one going to do it for us. The prevalent attitude is "We don't want to do anything to disturb the mining company operations." I venture: "Why not?" Their waste came right into our homes and disturbed our livesour health, finances, and eventually will affect our property values. New technology is available. See Report on copper mining in Florence, Arizona. "C" is also for "change"
It's time for some changes in Arizona and we will not get them unless we ask!